Powers/Abilities: Gemini could develop a linkage between his and his brother's minds, allowing one of them to combine their physical abilities, effectively doubling his strength, speed, etc. Initially Damian could draw on Joshua's abilities, but Joshua soon learned to control the connection, enabling him to either access Damian's abilities or to take control of Damian's mind and body, doubling its abilities in the process. In addition, Joshua had full access to all of Damian's memories while controlling his body. While he could use his power across great distances, Joshua was left in a virtual trance while controlling Damian. (Astonishing Tales#8/2 (fb)) - Joshua Link fell in with a bad crowd in school, becoming more wild and progressing to criminal activities; he started with penny-ante crimes, such as stealing from the grocery, and continuing on to rolling others for money and other valuables. He started to collect expensive friends with expensive tastes--"booze, broads, gambling"--and the more he tried these things the more he wanted. Eventually his father threw him out and told him to never come back. (Astonishing Tales#8/2 (fb)) - Years later, Joshua was barely recognized by his twin brother, Damian, who had become a police officer. (Astonishing Tales#8/2) - Working with the criminals Monk and Brackett, Joshua was transporting some stolen materials out of Futura Research Laboratory when they were confronted by Officers Jeff Hanley and Damian Link. Distracted by encountering his brother on the job, Damian and his partner were easily ambushed by Joshua's allies. In the ensuing struggle, Joshua and Damian were knocked into a metal chamber where they grasped hands as they were bombarded by "nameless experimental rays", until Brackett managed to deactivate the device. The criminals dragged Joshua--whose hair had turned stark white--away with them, leaving Damian for dead and shooting and killing Off. Hanley. However, 48 hours later, when they heard that Damian had survived and that he had identified Joshua, Brackett and the others decided that they would have to kill Joshua to prevent being linked to the crimes via their association with him. Joshua tried to flee, but was shot in the shoulder; in desperation he called out for his brother to help him, and Damian felt the contact, following it to save his brother. With his abilities suddenly doubled by his connection to his brother, Damian chased down and took out the other criminals. He then turned Joshua over to other policemen. (Astonishing Tales#17/2 (fb) - BTS) - Imprisoned for his crimes, Joshua learned how to control the linkage, taking control of and manipulating Damian to his own ends as he saw fit. (Official Handbook of the Marvel Universe Deluxe Edition#20: Zodiac (fb) - BTS) - Gemini, like the other Zodiac leaders, established a criminal organization served by numerous henchmen in his chosen base of operations and assembling for matters of collective importance. (Official Handbook of the Marvel Universe Deluxe Edition#20: Zodiac (fb) - BTS) - Following his horoscope, van Lunt relinquished control over the group and Zodiac took on a rotating membership, with each member presiding during the period in which his or her astrological sign held prevalence. (Avengers I#72) - Gemini was present with the other Cartel leaders when Nick Fury, posing as Scorpio, captured the Avengers (Captain America, Goliath (Clint Barton), Vision, Wasp, Yellowjacket) and Rick Jones, and brought them to their headquarters. Yellowjacket and the Wasp summoned thousands of ants to disrupt the device holding them, and the Avengers broke free before the Cartel could execute them. Fury then unmasked and joined them in fighting off the Zodiac Cartel, who fled through a hole in the wall Aries created with the Zodiac Key; Gemini's activities during the struggle were unseen. (Avengers I#80 (fb) - BTS) - Under the direction of Aries (Marcus Lassiter), Zodiac regrouped and began plotting their takeover of Manhattan. (Avengers I#80 (fb) - BTS) - Cornelius van Lunt led Zodiac's efforts to steal the land from Red Wolf's father, leading Red Wolf to pursue van Lunt's agent, Jason Birch, back to Manhattan. (Avengers I#80 - BTS) - Having learned something of Zodiac's activities, the Avengers prepared to oppose them, though they split into three groups, each pursuing a different agenda (unaware that all three were Zodiac related). (Avengers I#81 - BTS) - Van Lunt's men shot down the Avengers' quinjet containing Goliath (Clint Barton), the Scarlet Witch, the Vision, and Red Wolf, and van Lunt appeared to drown when the artificial dam was destroyed in the ensuing conflict. (Daredevil I#69 - BTS) - Zodiac backed the Thunderbolts gang, directing them to dupe other African-Americans into joining a seeming revolution against oppression, when they were really just common criminals; the Thunderbolts were defeated by the Black Panther, Daredevil, and William Carver. (Avengers I#82 - BTS) - Aries led the forces of Zodiac to ambush the Avengers (Captain America, Iron Man (Tony Stark), Quicksilver, and Thor), using gas to incapacitate then within Avengers Mansion, after which they were placed within stasis. (Avengers I#82 - BTS) - Aries led the forces of Zodiac to take over Manhattan, entrapping it within a force field, and threatening to slay the entire population if they did not receive one billion dollars within 24 hours time. The Black Panther and Daredevil freed the imprisoned Avengers, and Aries was apparently slain in the ensuing conflict. The army captured Zodiac's mercenary soldiers, and the force field was deactivated. The rest of the Zodiac Cartel escaped capture. (Iron Man I#33 - BTS, #34 - BTS) - The Zodiac Cartel, led by Capricorn, employed Spymaster and his Espionage Elite to destroy Stark Industries and to capture or kill Tony Stark. (Daredevil I#73 - BTS) - The Brotherhood of Ankh contacted Capricorn, instructing him to use the Zodiac Key to bring others to the Ankh dimension to restore the Key's power through conflict. (Iron Man I#35) - When Spymaster and his group failed, Capricorn reassigned him to capture Daredevil, which they did, obtaining Madame Masque in the process. Libra (see comments) joined Aquarius, Capricorn, and Sagittarius in traveling to Stark Industries, where they battled and overcame Iron Man, Nick Fury, and Kevin O'Brian with the aid of the Zodiac Key. The heroes were imprisoned alongside Daredevil, Madame Masque and Fury. (Daredevil I#73 - BTS) - Fury was mesmerized by the Key into using it to transport the heroes, the three Zodiac Cartel members, and Spymaster to the Ankh dimension, where they appeared before the Brotherhood of Ankh. The Law-Holder manipulated the heroes and villains into conflict, but disagreement over Daredevil's reluctance to fight under duress led the Brotherhood to send them all back to Earth. (Iron Man I#36 - BTS) - Daredevil, Nick Fury, Iron Man, and Madame Masque defeated Aquarius, Capricorn, and Sagittarius, who were taken away by the police, while Spymaster escaped. (Astonishing Tales#17 (fb) - BTS) - From prison, Joshua manipulated Damian into becoming Gemini, using him to establish an alliance with AIM, as well as with the criminal Plunderer. Gemini then hired the criminal known only as the Pusher to kidnap Dr. Wilma Calvin (a former colleague of Ted Sallis), in hopes of obtaining the Super-Soldier formula and using it to take over AIM. (Astonishing Tales#15 - BTS) - The Pusher and his agents sought to capture Dr. Calvin. Ka-Zar rescued her and fought off the Pusher and his men, who escaped, but the already injured Dr. Calvin was left in critical condition. (Astonishing Tales#16 - BTS) - Ka-Zar again defeated the Pusher. (Astonishing Tales#17 (fb) - BTS) - Damian Link became the police liaison between New York City and SHIELD. 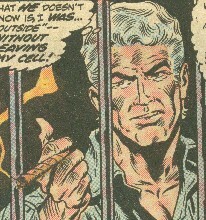 (Astonishing Tales#17) - Still in prison Gemini mocked the arriving Pusher for his failure. Meanwhile, Dr. Calvin had recovered and completed development of the Super-Solder serum that Sallis had been attempting to re-create. Damian Link was aboard the Helicarrier as Dr. Calvin presented her findings to Nick Fury, Bobbi Morse, Morse's associate Ka-Zar and his pet Zabu. Joshua took control of Damian, donned the Gemini costume he had caused Damian to unknowingly bring, and stole the sample, and escaped in a jet. Ka-Zar managed to grab hold of the plane's landing gear and hang on until it approached its New Jersey destination. Upon landing, Ka-Zar flattened Gemini, but the formula fell into the hands of the Plunderer, who was backed by his ally, the giant Tsiln known as Gog. (Astonishing Tales#18) - As Ka-Zar approached the Plunderer (his brother), Gemini recovered and attacked the jungle lord, meeting defeat again; however, Gog quickly subdued Ka-Zar. Bobbi Morse and Zabu arrived and the saber-toothed tiger flattened Gemini again, but Gog teleported them all to Liberty Island and went on a rampage. In the ensuing chaos, Bobbi escaped with the Super-soldier formula, and Gemini helped the Plunderer stun Ka-Zar; the latter two fled, though they both realized that without Gog or the formula they no longer had reason to need each other. (Astonishing Tales#20 (fb)) - Gemini and the Plunderer joined forces with Victorius, an AIM scientist who had created and been exposed to his own Super-Soldier formula variant. The three plotted a coup to overthrow MODOK and take control of AIM. (Astonishing Tales#19) - Gemini and the Plunderer assisted Victorius in ambushing and capturing Morse. However, the serum had already been turned over to SHIELD, and Victorius sought to torture Morse to learn the serum's location? (sic). 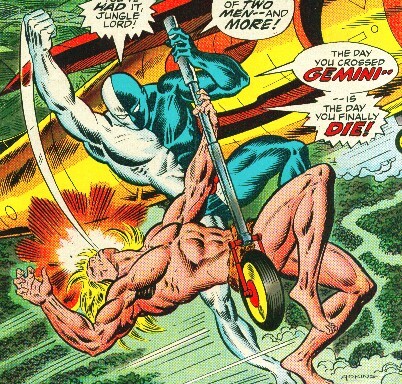 Gemini and Victorius quickly became antagonistic towards one another, and Gemini slipped away shortly after Ka-Zar's arrival (though not without another punch in the mouth from the jungle lord). (Astonishing Tales#20) - Gemini abandoned his allies, removing his costume and sending Damian back to New York city, after which he withdrew his control, leaving Damian mystified over another unexplained "blackout." (Avengers I#120) - Cornelius van Lunt met with the imprisoned Joshua Link, identifying himself as Taurus and revealing his knowledge of Joshua being Gemini. Taurus then revealed the Zodiac Cartel's plot to prove their power by using the Star-Blazer to snuff out everyone in Manhattan born under the sign of Gemini; having been imprisoned during the vote, Gemini's sign was chosen. After Taurus revealed their intent to protect Joshua, he revealed his origins to Taurus, explaining the need to protect Damian as well. (Avengers I#120 (fb) - BTS) - Taurus then arranged Joshua's release and instructed him to control Damian until he could decide the best course for capturing him. Joshua did take control, having Damian don his Gemini costume beneath his police uniform before relinquishing his control. (Avengers I#120) - Sgt. Damian Link met with the Avengers, having been instructed by the police commissioner to act as a liaison to the Avengers (as he did with SHIELD). Joshua then took over his mind, and his subsequent obvious interest in a secret weapons system led to the Swordsman (Jacques DuQuesne) confronting him, a superficial sword stroke exposing the Gemini costume. Attempting to fight his way to freedom, he was quickly subdued by Thor, after which Joshua again withdrew his control, leaving Damian to question his own costume and situation. Irritated by Gemini's needless exposure and capture, Taurus then led the other ten members of the Zodiac Cartel to break into Avengers Mansion. Taurus used a hand-held Star-Blazer to overpower the Avengers (Iron Man, Scarlet Witch, Thor, Vision). Joshua again took control, ambushing the Avengers' ally Mantis, who had snatched the Star-Blazer from Taurus, and allowing the others to dog-pile on and defeat her. Zodiac then escaped. While the Zodiac Cartel publicly made their threat, Capricorn completed application of double-strength Nullify-Nodes to protect Joshua (and by extension Damian) from the Gemini-attack. However, the Avengers located them and damaged the Star-Blazer, but Taurus used its remaining energy to blast Mantis. (Avengers I#121) - The Avengers attacked the Zodiac Cartel, but Aries (Grover Raymond) cast Mantis over the edge, and the Zodiacs fled in the ensuing chaos as they rescued her. Aries, frustrated with their near defeat, gathered Aquarius, Cancer, Leo, Libra, Pisces, Sagittarius, and Scorpio to form a coup to overthrow Taurus, choosing to leave Gemini out of his plans as Gemini owed Taurus his life for the advance warning during the Gemini-attack. Taurus, however, trapped the renegades, along with the Avengers, and launched them into space. (Avengers I#122) - Learning of Taurus' actions and mistakenly assuming Mantis (whom he had recognized as his own daughter) to be trapped as well, Libra ambushed and overpowered Gemini (Joshua), and then freed Damian Link. Replacing him in his cell with Joshua, Libra convinced Damian to impersonate Gemini and keep Taurus occupied while Libra rescued Taurus' victims. Taurus recognized the treachery when "Gemini" (Damian) mistakenly referenced a long term friendship with van Lunt, who then unmasked him and punched him out. Nonetheless, Taurus and the rest of Zodiac (except Libra) were ultimately defeated by the Avengers. (Avengers I#123 - BTS) - The Zodiac Cartel, with the exception of Libra, were then turned over to the police. (Official Handbook of the Marvel Universe Deluxe Edition#20: Zodiac (fb) - BTS) - Gemini, like the rest of the heads of the Zodiac Cartel, eventually regained his freedom under uncertain circumstances. (Iron Man I#184) - Following an assault on Cornelius van Lunt by the Maggia-sent Life Model Decoy (LMD) Taurus (which resulted in an encounter with Iron Man (Jim Rhodes), van Lunt contacted Gemini and the rest of the Zodiac Cartel, announcing his plans to kill Iron Man. When van Lunt's initial plan failed, he recruited help from Aries (the unnamed successor of Grover Raymond). When he, too, was defeated, van Lunt recruited Aquarius (Zachary Drebb). (Iron Man I#185 - BTS) - Iron Man, with the help of Morley and Clytemnestra Erwin and the unarmored Tony Stark, defeated and captured Aquarius. Stark then notified Nick Fury of Zodiac's activities, and Fury said he'd "scramble a security team an' put the skids under 'em pronto." (West Coast Avengers II#26 (fb) - BTS) - Due to trouble from the Deltites and others, SHIELD was unable to follow up on pursuing Zodiac. (West Coast Avengers II#26) - In Houston, Texas, Gemini met with the rest of the Cartel at a meeting presided over by Cancer. However, Scorpio suddenly unmasked, revealing that an LMD of Jake Fury had been his own "successor," after which the rest of the LMD Zodiac ambushed the Cartel, apparently killing all except van Lunt, who escaped. (Marvel Tarot - BTS) - Ian McNee's reading of the First Tarot noted a relationship between Gemini, the other air signs, Oshtur, and numerous other objects, beings, and concepts. Comments: Created by Roy Thomas, Sal Buscema, and Sam Grainger. As a Gemini, his birthday would be between May 21 - June 20. Joshua's brother's name is spelled Damian in his first appearance, Avengers#120-122, and the OhotMU, but is Damien throughout Astonishing Tales#17-20. In Astonishing Tales#17, Gemini said his physical abilities were tripled, but that's the only time that level was described. Damian wore the costume in West Coast Avengers II#26, and when he was killed, the psychic trauma killed Joshua as well. Joshua wore the costume in West Coast Avengers II#26, and when he was killed, the psychic trauma killed Damian as well. Whoever was wearing the costume was killed, but the other one survived--though he might have been traumatized to varying degrees. Whoever was wearing the costume was killed, but managed to transfer his psychic energy into his twin, leaving one of them alive, but still possessing double powers. Whoever was wearing the costume appeared to have been killed, but either the double-abilities enabled him to recover, or the other twin bolstered his form, helping it to recover. This would mean that both still live, preserving the status quo. Take your pick, or offer another option! Gemini - Zodiac-LMD, battled West Coast Avengers under Scorpio, deactivated in Ankh dimension. actually the re-formed version of the above. Twin brother of Joshua, he attended police academy, becoming a cop and aspiring to be the best he could be, possibly trying to make up for his brother's failings. He eventually crossed paths with Joshua, the two now on opposite sides of the law, and they were psychically linked by exposure to an unknown energy. While Damian initially controlled the linkage, using energy drawn from Joshua to rescue him from his criminal allies, Joshua subsequently learned to control the link, manipulating Damian from within prison. 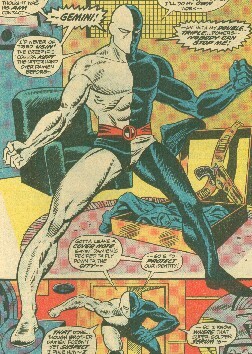 While Joshua established himself as New York liaison to SHIELD and later the Avengers, Joshua used him in plots involving AIM and Zodiac's Gemini-attack. Damian's fate following the Zodiac Cartel's capture is unknown, and the fate of either brother is similarly unresolved following the apparent death of a Gemini at the hands of the LMD Zodiac. note: He may or may not have appeared in any or all of Gemini's appearances as listed under the main entry. Next to nothing is unknown about the Link twins' father. He threw Joshua out of his home when his criminal activities crossed an unspecified line, telling him never to return. His subsequent fate is unrevealed. Next to nothing is unknown about the Link twins' mother. She either lived with Damian during his adult career or he just visited her shortly after his mutation, during which time he had to pass on the dinner she made, because he wasn't feeling well.